On the sixth day of creation, God made them, and us! (Monarch Butterfly (Danaus plexippus) - 01) As we were taking a walk, Mary spotted this monarch butterfly. 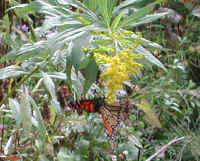 This beautiful creature was flying on the opposite side of the road; then she flew behind us on our side of the road, and then she flew back to the other side of the road and landed on this Canada goldenrod which was swaying back and forth in the autumn breeze. Usually, we find it hard to get close up photos of butterflies because they fly away as soon as we approach, but this one stayed so we could take this series of pictures. (Monarch Butterfly (Danaus plexippus) - 02) The monarch butterfly is one of the most amazing of God's little folk. These tropical migratory insects fly as far as two-thousand miles each way on their journeys back and forth between Central America and North America. 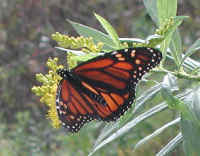 Not all monarchs migrate northward. Permanent breeding colonies have been found in the Caribbean and other parts of the American tropics. (Monarch Butterfly (Danaus plexippus) - 03) From the markings on the rear wings, we can observe that this monarch butterfly is a female. The dark veining on the female is thicker than on the males, and the vein closest to the body of the male has a black dot. (Monarch Butterfly (Danaus plexippus) - 04) A monarch butterfly may lay as many as several hundred eggs on milkweed plants, but usually only one egg on each plant. In normal summer weather, the eggs hatch in about 4 days, and the larva eat almost continuously for a week and a half to two weeks, shedding its skin ever two to three days. 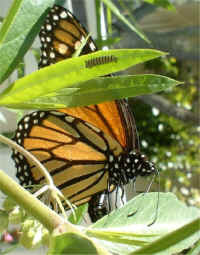 The larva then enters the pupa stage for a similar period of time, after which he or she emerges as an adult. These are some of the things we believe Paul was thinking about when he wrote that we are without excuse if we don't recognize the presence of God in His creation (Romans 1:20). 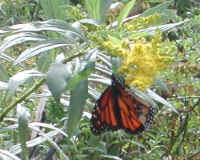 (Monarch Butterfly (Danaus plexippus) - 05) All the time we were trying to take these photos, the Canada goldenrod kept swaying back and forth in the breeze, which didn't seem to bother this monarch butterfly as she fed on the goldenrod nectar. 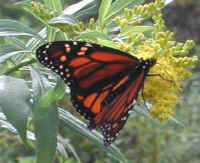 Occasionally, she would open and close her wings, and take up a new position on the goldenrod's flowering head. (Monarch Butterfly (Danaus plexippus) - 06) After about five minutes, this monarch butterfly flew away to visit another flower. Shortly, she will join other monarchs and fly south to the Transverse Neovolcanic Mountain Belt in Mexico, where most eastern monarchs migrate for the winter. The Bible's prime directive is for us to love God with all our heart, soul, might, and mind. We cannot fully do that unless we also love His creation, too, and our neighbors as ourselves. Furthermore, we will never have a true and lasting peace until we fully recognize all other living beings as our neighbors, and stop killing and eating them. Go with God, sister butterfly! 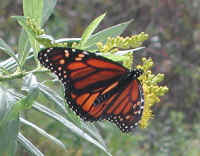 (Monarch Butterfly (Danaus plexippus) - 07) This monarch butterfly photo was sent to us by Jenni Gottschalk on 12 Jan 2005. She wrote: "I just took a photo of a Monarch Butterfly in the process of laying an egg and was so excited about it that I had to share it with someone." Thank you Jenni!